Wind damp heat syndromes marked by red swollen joints, especially affecting the knees. Also for wei syndrome due to accumulation of damp and heat with symptoms of heaviness, weakness and flaccidity of the lower limbs or numbness with slight swelling in the lower limbs. 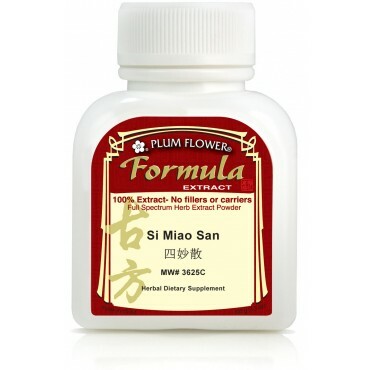 Rheumatoid arthritis and in painful joints due to rheumatic fever, gout or lupus are some of the imbalances satisfied clients have used this product for. Phellodendron chinense bark, Coix lacryma jobi seed, Atractylodes lancea rhizome, Achyranthes bidentata root. - Huang bai, Yi yi ren, Cang zhu, Huai niu xi. Contraindicated during pregnancy. Caution when nursing.